There were quite a few glossy, oil soaked Crisps that needed munching into. What followed was a a thick, firm, maybe even rigid crunch. 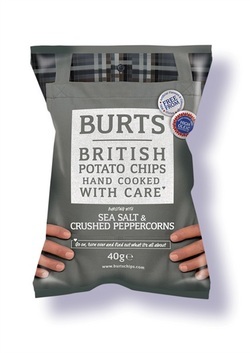 The Crisps did not melt in mouths as quickly as some potato mushy Crisps. These were thicker than the average Crisp, and if they were more irregularly shaped, would have looked like the more familiar batch fried Chips. The surface of the Crisps did not include lots of small bubbles, but there were a few larger, and often broken oil vesicles. The colouring was mostly a golden yellow infused with oil. There was a reasonable sprinkling of ground black pepper seasoning. A Nose Plunge Test revealed a mild cheesy aroma. A closer sniff and a mild peppery smell was apparent. It is hard to pinpoint, but there was a very slight cheesy background taste to what were basically Pepper Crisps. Even the odd Crisp without any black spots on lacked Salt. In a flavour pairing it is important that a balance is created. These were all Pepper - really nice Pepper, but they would have needed to be called Just Pepper, to get higher marks.